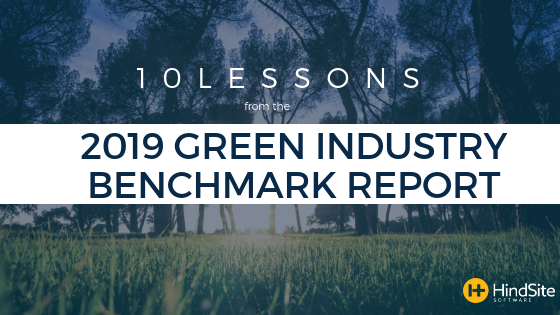 The first thing that’s readily apparent from the Benchmark Report – and from talking to any green industry contractor looking to grow – is there’s a labor shortage in the green industry. As the economy has consistently improved since the recession, the unemployment rate has dropped, and it’s very difficult for green industry businesses to find employees. The labor shortage was apparent from a number of results from our survey, including that attracting and retaining employee was the biggest area in need of improvement for more than ⅓ of green industry businesses surveyed. That’s basically the same as our survey found a year ago, so hiring still is a significant issue. Given that attracting and retaining employees was most frequently cited as the biggest issue, it shouldn’t come as a shock that 92% of green industry businesses surveyed said it was either somewhat or very difficult to find good employees, an increase of 4% over a year ago. As I’ve heard from a number of green industry businesses, the work is out there, but finding employees to do the work is difficult. So businesses continue to look for employees, with the understanding that if they find good employees, they can grow their business rapidly. In fact, nearly a quarter of respondents expect to grow their staff by 6 to 10% in 2019, up from 20% a year ago. 30% expect to grow their staff by more than 10%, while just 2% expect to decrease their staff. So the bottom line: Green industry businesses are still looking to hire, even more than a year ago. So what tactics should you use to attract employees? Well, unfortunately, I don’t have any easy answers. We ask where folks get their best applicants, and the overwhelming majority of respondents indicated they get their best applicants from word of mouth. Even worse, when I cross-referenced the applicant source with those that find it very easy or easy, there wasn’t anything significant that stood out. Those that found it easy to find good applicants were just as likely to cite word of mouth as their best lead source. Hiring may cost more. You may have to pay more in order to attract and retain employees. In a competitive hiring environment, wages will be inflated. I’ll discuss this a bit more later, but think of creative ways to pay people more without sacrificing the long-term viability of your business should the economy hit another slow-down. So that might mean sign-on bonuses, it could mean a bonus structure based on performance, etc. But getting good workers to work for your business will likely cost more than it did 7 to 10 years ago when unemployment was double what it is now. Try something new. Don’t be afraid to experiment with hiring sites. Online job boards like Indeed might be successful for you. A couple businesses I’ve talked to said they leverage relationships with local high schools and community colleges to find a pipeline of good employees. Social media has been successful for some. Talk to your local distributor or manufacturer’s rep to see if they know of anyone that might be looking. One of our customers said they leverage their customers when they’re hiring and always have a help wanted sign and phone number to call on their truck. The best marketing advice I ever heard also applies to hiring – try a lot of different things and do more of the things that work best. The biggest thing I’ve learned when hiring is the wider the net you cast, the more likely you are to find a great employee. If you rely solely on word of mouth, eventually you’ll run out of people. Be a place people want to work. Finally, focus on your culture. I’ve seen studies that show that while most people think money is the key to retaining people, it’s really about being an employer people want to work for. If you’re a place people want to work, it’ll be easier to attract and retain great employees. In fact, a recent study of millennials say they would take a 6 to 12 percent pay cut if the job offered long-term job security, flexible hours, mentorship opportunities, and the business is growing rapidly and employs talented, smart people. So focus on building a company people want to work for and it’ll be easier to find great people to work for you. At a bare minimum, you need branded trucks and a website. But what I discovered in the Benchmark Report data is that – if you’re really looking to grow – online advertising should offer the most bang for your dollar. For the typical green industry business, websites and branded trucks are the two most popular marketing tactics, followed by social media. There’s a big drop from those three tactics, though online advertising was used by almost 30% of respondents, up about 6% from a year ago. If you cross-reference marketing tactics with year-over-year revenue growth rates, you’ll see that about 40% of businesses that grew by 20% or more were using online advertising, compared to about 30% of those with between 6 and 20% growth, and about 26% of those with growth in the 1% to 5% range. So the key takeaway is that online advertising is one of the marketing tactics that can spur higher levels of growth. Make sure your house is in order. First, refine your sales process and make sure you can operationally handle a large influx of leads. If your sales process isn’t streamlined, you’ll find that you’re wasting money buying ads because you don’t have the time to convert those leads into sales. So take a look at your process and maximize your ability to sell. Also, don’t forget about operations. You can’t dump a bunch of new jobs on your team if you don’t have the equipment and labor to handle those jobs. Really, again, it comes down to knowing your numbers. If you have the operational capacity and sales infrastructure to handle new leads and sales, increasing your marketing spend makes sense. If you don’t, it doesn’t. NextDoor is the current hot new thing. NextDoor is a social network for neighborhoods. So you can create an account and then starting posting messages. A common thing I see on NextDoor is posts like “Who is a good snow removal business?” and other neighbors respond with who to use (or who not to use). So it’s less of a paid channel now than a way to spread word of mouth online. I’ve heard a lot of good things recently about NextDoor. A number of people have said they “advertise” on NextDoor. I don’t think NextDoor is taking ads from service providers yet, but I expect that they will in the near future. So ask your customers if they use NextDoor, and if they do, to mention you. The great thing about it is it’s a way to connect to people in the neighborhoods you already serve through word of mouth. All online advertising isn’t created equal. Finally, know which people you’re most likely to attract in each of the online advertising channels. For example, platforms like Facebook and Google Ads can be effective for residential businesses, while LinkedIn may be better for commercial businesses. And then there are the lead generation options like HomeAdvisor or Angie’s List. I’ve heard good and bad things about every single one of these online channels, so it’s best to do a small test and try it for yourself to see if it works in your area. Software is helping green industry businesses get more work done. About 50% are using software, which isn’t any significant change over a year ago, but is nearly double what we saw when we first conducted this survey about 7 years ago. Generally, small businesses are the ones not using software. Only about 30% of businesses with less than 6 employees are using software. That grows to about 45% of those with 6-10 employees and over 60% of those with more than 10 employees. There are a myriad of benefits, but more efficient operations was the most frequently cited benefit of software, with 37% of software users saying it’s the biggest benefit. That said, software also enables businesses to deliver better customer service, invoice easier, improve cash flow and improve communication with both field staff and customers. Identify Your Core Issue. Know what issue you’re trying to solve. There are different pieces of software that address different issues better. For example, if you’re looking to improve scheduling and routing, we have tools that make that easier and enable you to schedule more jobs every day by creating tighter routes. If you’re looking to create landscape designs, there’s great CAD software for that. By understanding and articulating what issue you most want to solve, you’ll be better able to target your software search. It’s a process, not an event. Understand that installing software – especially something like HindSite that is more like a business operating system than an app – is a process, not an event. The first conversation we have when a new customer orders is about a roadmap for implementing the software. Companies that try to do everything at once – Scheduling, routing, field data collection, inventory management, fleet management – tend to get bogged down by too much new information and change management issues. We always try to get companies to start small. Get the system setup, then get one technician or crew up and running for a week or two and slowly add more techs and crews. Then repeat with other divisions as necessary. A phased approach ensures a better experience. You need a partner. Finally, look for a partner, not a software provider. I like to use Google products as an example. I love their products – Gmail, Sheets, etc. I even signed up for their phone network, Google Fi. Their software is excellent. Their support is not. We’ve found that most green industry businesses are not the most tech-savvy. They’re great at doing the work in the field and serving customers. They don’t spend a lot of time with software. That’s why we’ve got a team of support and training professionals that offer unlimited help. Most people get wowed by software – and I know, especially in the lawn care industry, there are a lot of free or nearly free providers out there. That means they’re likely either charging extra for support or not really supporting the product at all. You’ll realize how important support is when your software goes down in the middle of the day and there’s no one to talk to that can help fix it. This is part one of a three part series. Parts two and three will arrive soon.